No words. No explanations. No pat answers. No quasi feel-good Bible verses to make it all somehow okay. No, it's not okay. I've got nothing but bewilderment. Man's inhumanity to man. Sigh. Does God care? Yes, I have no doubt about that. Then why does He allow hunger and homelessness? Maybe the better question is: Why do we allow it? Hmm. I have no answers. I've got nothing; nothing but a reminder of something that Jesus once said, "Foxes have holes and the birds of the air have nests, but the Son of Man has no place to lay his head" (Mt.8:20). 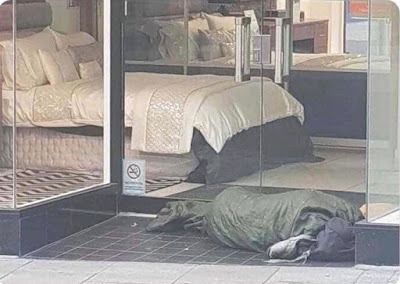 If Jesus walked the earth today, I wonder where we'd find him sleeping at the end of a long day? Oh God, have mercy! Oh God, forgive our inhumanity! And no one knows your name. And no one hears your lie. As the blood pumps through your veins. As you wander through the streets. And beg beside the blind. Yes, a picture really is worth a 1000 words. May we let that image sink in and meditate upon it, until "giving is in fashion;" and until someone cares enough to really listen to the pain. Oh God, have mercy! There but for the grace of God, go I. Peace. "All the fat is the Lord's"
Lately I've started playing with creating my own memes. Why? Because the truth is, I don't think we Christians laugh enough, and in my way of thinking, that's a shame. Laughter is God-created too. He must have had a reason for it. Memes are great because they're short easy to read messages. They can engage a busy reader who may not give you the time for even a short blog post. Little blurbs, that hopefully resonate some profound nugget of truth, mixed with a comical chuckle-inducing pun and image. What fun! You could say they are the bumper stickers of the online world, and who hasn't chuckled a time or two by bumper stickers? We all have. Yes, that is my dog and me. I was particularly amused by the look on her face, enhanced by her closed eyes, as if she were thinking, "Oh no, not another bad dad joke." What perfect meme fodder! LOL. It is no secret that I could stand to lose a bit of weight; so could fur-baby according to the vet. 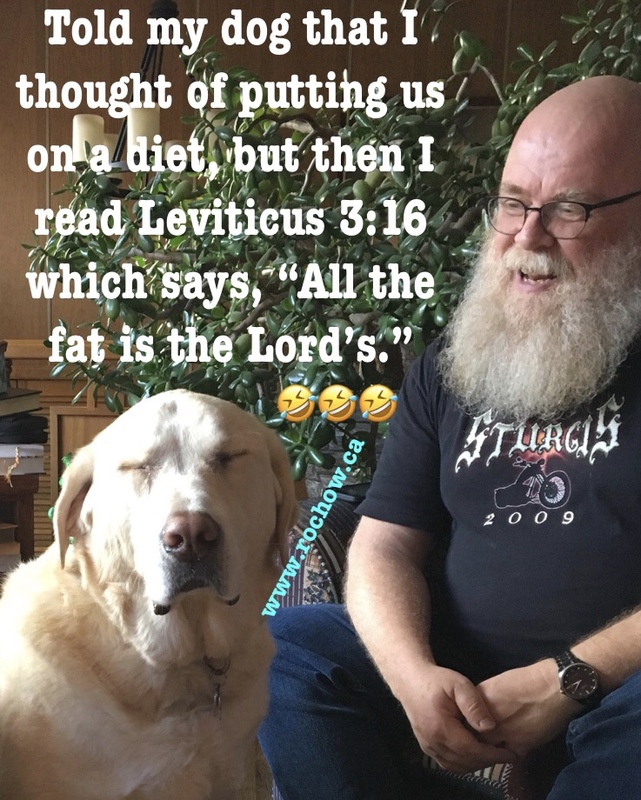 But the humorist side of me was amused to jokingly justify my obesity and not bother dieting because, as Leviticus tells us, "all the fat is the Lord's." Who are we to strive with our dieting to take it away from Him? (Not even close to being theologically correct; I know). So watch for them. They'll pop up from time to time on Facebook and/or Twitter and be identified with the www.rochow.ca embedded in them. Hopefully, at the very least, they bring a little smile to your day as they do to me. Peace and Blessings. "There is a time for everything … [including] a time to laugh."